Earn credits from each purchase and use them to buy more! London, 1 March 2019 – More and more customers take increasingly greater interest in 3D printing models displayed on Gambody and place their new orders on our marketplace. Every day you return to take up always exciting and creative challenges, thanking our contributing 3D artists for such an opportunity. This spring for the first time Gambody announces and launches a campaign specially for all the regular customers to show our gratitude for your loyalty, so that each of you could see that your contribution to the world of 3D printing has never passed unnoticed on our marketplace. What is ‘Customer Loyalty Rewards’ about? When purchasing 3D printing models on Gambody you receive a certain percentage of the money you’ve paid* back to your Gambody account’s balance in the form of credits that you can use when placing your future orders on 3D printing designs on our marketplace. *Money you’ve paid is the amount you were charged for the 3D printing model/s that does not include credits from your Gambody account balance or discounts from Gambody campaigns. What percentage (how many credits) do I receive as a loyal customer? For example, since the moment John Smith has registered a Gambody account he has spent 9.99$ on 3D printing model. Supposing now he wants to buy a new 3D printing figurine that costs 24.99$ on Gambody. 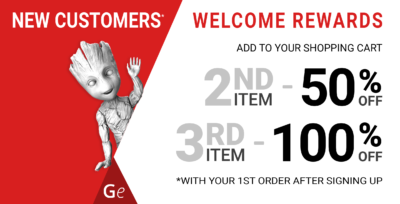 Having placed his next order on new item on our marketplace, being a loyal customer, John will receive on his Gambody account 10% of the sum he paid in the form of credits, namely 2.49$. These credits he will be able to use for his future purchases to save his money. 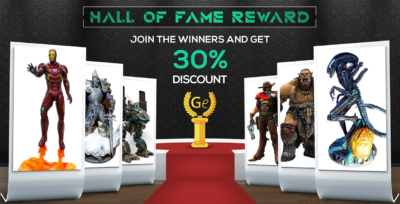 When John will eventually spend 50$ in total on 3D printing models from his Gambody account, he will start becoming 15% as credits from the orders he will place in future and so forth. What are the credits and where can I see how much I earned? 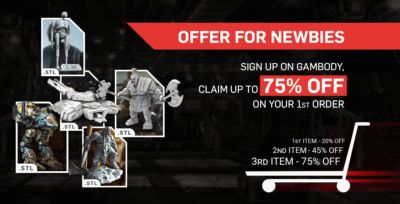 1 credit is equivalent to 1$ that you can use to reduce the sum you are to pay for the 3D printing models on Gambody marketplace you are interested in. 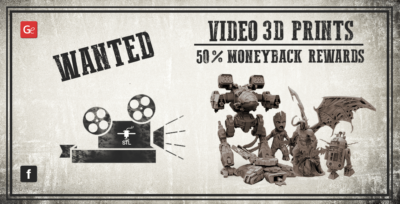 Our old customers may remember the credits rewards system from Gambody’s MoneyBack Campaign, when the clients who shared the photos/videos of their 3D printed results in our official Facebook group received 50% of the amount they spent back to their account’s balance in the form of similar credits. All the credits you have currently available you can see after logging in your Gambody account, in the top-right corner of the website near your Gambody account’s name. Upon clicking on your account’s name you can select tab ‘Earned’ to be redirected to ‘My Earnings’ page where one can track the amount of credits both received and spent. All the customers who became loyal on our marketplace before the 1st of March 2019 can already find 5 credits on their account’s balance that were provided by Gambody as a gift for all of you to get a better understanding of how the credits system is going to work. In what way do I use my credits? Having chosen any your desired 3D printing models on Gambody marketplace you add them to your shopping cart and proceed to Checkout page. There you are going to see the ‘use my balance’ option where the ‘balance’ is your amount of available credits indicated in the brackets. In the corresponding field below you can enter how many credits you want to include in your current purchase or whether to include them at all. The credits you use will influence the final sum you are to pay and will be reflected in the Amount Due field. Moreover, it is possible to use both credits and any discount coupon that you’ve earned in accordance with any other Gambody campaign at the same time. Where can I see the total sum I’ve spent? Upon clicking on your account’s name on gambody.com you select tab ‘Purchases’ that redirects you to ‘My purchases’ page where both the total number of purchased items and the amount of money paid are indicated. A 3D printing website where users can buy and sell 3D printer files. Buy 2 Models and Get the 3rd Free with your First Order! "You might have already realised that there is no way to withstand this battle without your own dragon. Hurry up, tu… https://t.co/jj98tq5PJV"
"Spider-Man in his classic suit by 3d_fanatic is almost 33 cm tall! What an amazing job! We are looking forward to s… https://t.co/i80twu1bOD"
"Order STL files of TIE-Fighter for 3D printing here ➡️https://t.co/xb1r2e5DhN We are introducing the legendary Impe… https://t.co/tS210HQjZ3"
"Doc Brown figurine’s painting tutorial is already on our YouTube channel! You will find a useful and concise painti… https://t.co/Ez2M07Lgko"
"Order figurines of your favourite characters and print them on a 3D printer! After all, you will enjoy not only the… https://t.co/BgT6krZUlg"
This blog was created to provide you with useful 3D printing articles and the latest news of the world of 3D technology and machines. Copyright © Gambody, 3D Printing Blog. 2019 • All rights reserved.